General engineering programme is a 5 years programme, opened to french and international students. The first two years (EIGSI-1 and EIGSI-2) of the EIGSI 5-year general engineering programme are critical years for the engineering students as they prepare to move into the EIGSI-3 engineering cycle. During these two years, EIGSI students take advanced courses in general engineering sciences (algebra, geometry, calculus, complex series, etc. ), but also in applied scientific subjects (electrical systems, informatics, automation, mechanical systems, energetics, etc.). EIGSI-1 and EIGSI-2 form the basis of the common core on which EIGSI engineers can build their future career in engineering. It is also in the first year that the engineering students begin thinking about their career plans. They begin personalizing their choices in their third year (major, study abroad, industrial mission and Innovation & Entrepreneurship projects). The last three years (EIGSI-3, EIGSI-4 and EIGSI-5) correspond to the engineering study programme. Starting in EIGSI-3, the classes become increasingly multidisciplinary. EIGSI strongly emphasizes project management, organizational knowledge, as well as specialized classes. 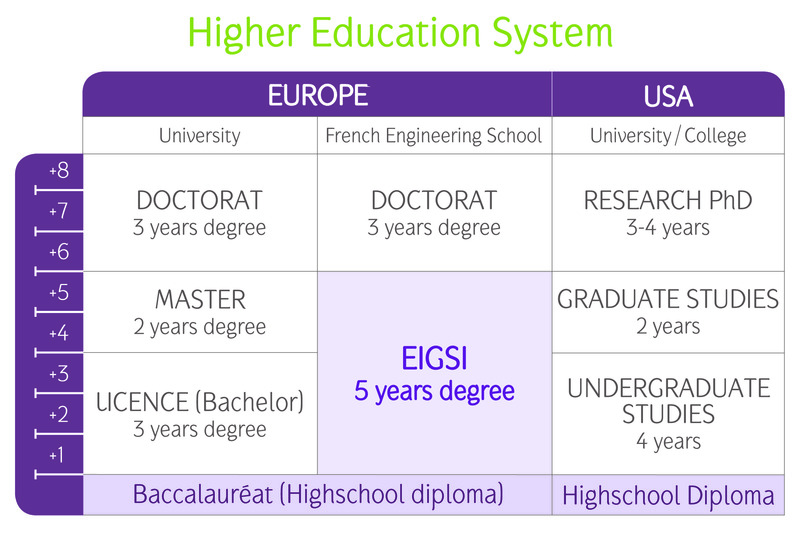 Students choose one of seven majors at the end of EIGSI-3. In EIGSI-4 and EIGSI-5, the major accounts for nearly two thirds of the classes taken. EIGSI’s engineering programme trains general engineers able to undertake any the main engineering job functions, whether in the area of research, studies, design, industrialization, production, operations or marketing. Finally, EIGSI engineering students are able to personalize their study programmes during the Engineering programme. Depending on what they choose in terms of international experience, major, internships and industrial projects and Innovation & Entrepreneurship projects, the students can tailor the study programme to meet their professional goals.